Posted February 12, 2019 & filed under GET ORGANIZED WITHOUT LOSING IT. The original working title for GET ORGANIZED WITHOUT LOSING IT back in 2005 was “Where’s My Stuff?” “Stuff” is the first thing we think of when we think about becoming organized, because that’s what surrounds us and threatens to drown us day in and day out. I found two rules of stuff management that work for me and hopefully will work for you. First is, “A place for everything, and everything in its place”, and the second is “Use it or lose it”. Let’s start this week with the former. 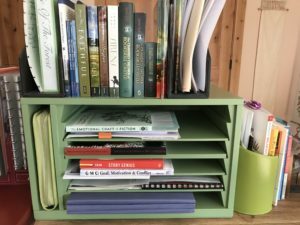 About the time I was writing GET ORGANIZED (really, I wrote it for my son, who was struggling with these things in early middle school) I watched my mother-in-law constantly misplace things. Her car keys. Her purse. Her wallet. Her wedding rings. What I observed was that each time she put something down, she put it down in a different place. She had an old, bad habit. Whether you’re young or old makes no difference if you can’t find what you need when you need it, or worse, if you think you’ve lost something important (like a wedding ring or wallet). So the rule “a place for everything” really means that once you decide where something should live when it’s not being used, that’s where it should live. Done and done. As we age it becomes even more important to recognize that the strategy of not having a strategy can be time-consuming or stressful. For instance, if you tend to throw your car keys on the nearest table when you walk in the door – or maybe you throw your car keys on any old table – perhaps make a habit of hanging the keys on a hook designated for that purpose or placed in a bowl always left on the table. This may sound obvious, but how many of us have left keys in a jacket pocket only to leave the coat behind when it’s warm? 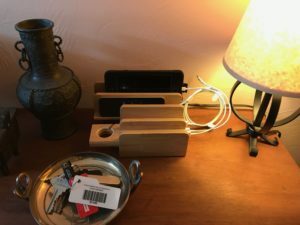 And for phones that need to be plugged in I suggest a stand that holds the phone and charges at the same time, and can be left near the door. As to storage boxes and file cabinets, I would suggest that as you do start to de-clutter and become organized, be sure to label storage boxes clearly for contents so that you can find what you need and return it to its proper place when you’re done. I’m a big fan of nice-looking storage especially if you want to live with storage boxes in your house (as opposed to your garage). More of my own storage solutions. Out of the way, but visible. If you’re tight on space the “place for everything” rule is even more crucial. 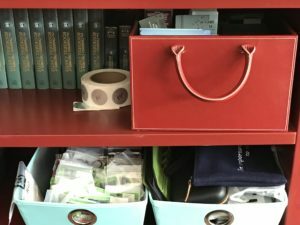 I suggest to kids who do homework in a family room or kitchen that they create a “homework box” that holds everything they need – paper, pencils, tools like scissors. If you need a home office but don’t have the room, you can follow a similar plan – find an attractive box or boxes to hold the stuff you need when you work and that can look nice when you want to put things away. Again, labels are important so that when you need to get to work you don’t have to waste time trying to find your tools. Having separate bins for “bills to pay” and “receipts/paid” (with the latter then ready to be filed by category) will save hours both at bill-paying and tax-paying time. This “place for everything” rule works for clothes closets, too. 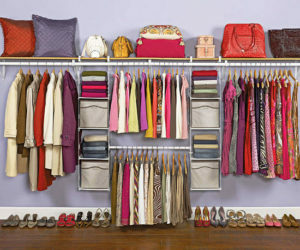 Think about organizing your closet space by clothing types: shirts, pants, skirts, jackets, and dresses each in their own sections. You can further refine this if you organize within these categories by color – and, by the way, you’ll see where you have duplicates, or where you’ll be able to match outfits. Finding “a place for everything” is a matter of changing habits, but those habit-changes will truly benefit you as you age (since we all become more forgetful) or if you lead (and who doesn’t?) a busy life. Stay tuned next week for my “use it or lose it” rule suggestions. « Resolutions 2019: Get Organized! I really need more storage bins for all of the stuff on and around my desk! Particularly my yarn and my crocheting paraphernalia!